In this interactive webinar, Gail Mercer, founder of TradersHelpDesk, will explain the different types of binary options and how to identify which one is right for your trading personality. In this interactive webinar, Gail Mercer, founder of TradersHelpDesk, will teach you the essentials for learning to trade forex binary options and spreads. Presenter: Apex Investing With multiple strikes and expiration's to choose from, do you ever wonder which binary you should choose? Which one will best fit your strategy or system? This course is designed to provide information on the mechanics of trading Binary Options within the Global Markets. I’m New to Trading Spreads – Where Do I Start? Should I Trade Nadex Binaries or Spreads? Nadex offers two capped risk products, binaries and spreads. Which should you trade? Do market conditions matter in making this decision? A live and interactive course focused on trading the world’s largest market with via a fixed risk contract. Are You Choosing The Right Nadex Spread For Your Strategy? Nadex Spreads are a very simple way to mirror the underlying market with capped risk! But, you must understand how spreads work and make sure to choose the right one for your strategy. Whether you are new to trading Nadex products or have some previous experience, this interactive webinar will be a great way to learn more about binary options. Most of us have heard the old trading maxim, "the trend is your friend". Learning how to spot trends and use momentum is a key for traders of all skill levels. This course is designed to provide information on the mechanics of trading Spreads using our proprietary platform. The Nadex charting platform has twenty-four built-in indicators. Nadex Touch Brackets vs Nadex Call Spreads- Part 1. When should you use them? Presenter: Apex Investing Nadex Touch Brackets offer new exciting potential trade opportunities but how do they stack up against Nadex Call Spreads? Touch Brackets are a new and exciting way to trade the financial markets. I'm New to Trading Binary Options, Where Do I Start? 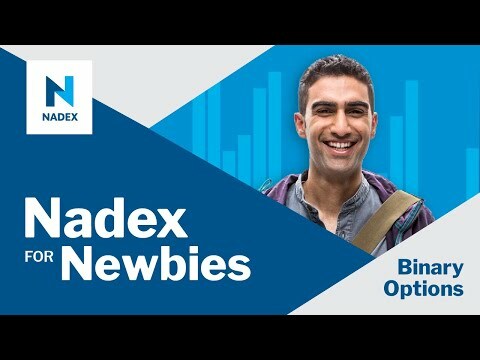 Listen to Gail Mercer, the founder of Traders Help Desk, guide you through the tools available on the Nadex platform and reviews the basics you need to know when trading binary options.